The Style Journal by Molesquine already make part of my special notebooks and the next one is the Runway Notebook by Smythson. Some seasons ago i had seen it ( and adored it ) so this time i can't really miss it on my essentials for the upcoming Fashion weeks that are just around the corner . Yay ! 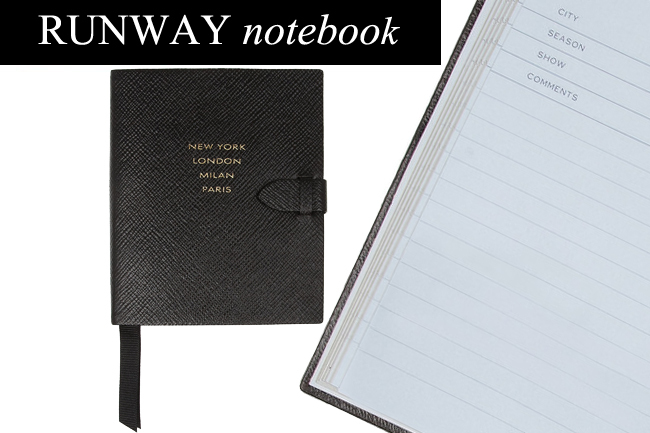 O Style Journal da Molesquine já faz parte dos meus notebooks especiais e o próximo é o Runway Notebook da Smythson. Há algumas temporadas atrás tinha-o visto ( e adorado ) por isso não pode mesmo faltar nos meus essenciais para as próximas semanas de Moda que estão quase , quase a chegar ! Yay !